Bike to the Sea To Celebrate 25 Years With Beer and Food – Bike to the Sea, Inc.
Bike to the Sea, Inc. will celebrate its 25th anniversary at its annual meeting on Nov. 9, 2017 at Down the Road Beer Company, the newest brewery to open in Everett. The meeting, which is free and open to the public, will be held from 6 p.m. to 9 p.m.. It will include food, beer, and an inspiring talk by Craig Della Penna, a leader in the development of the Mass Central Rail Trail. Donations are encouraged. Beer tickets will be available with donation. A limited potluck buffet will be available. “We are happy to be a sponsor for Bike to the Sea and join them in celebrating 25 years of trail development as one of our newest customers,” said Down the Road taproom manager Mellissa Conner. The brewery is located at 199 Ashland Street, in Everett. For the past 25 years Bike to the Sea, Inc. has worked on creating the Northern Strand Community Trail, which now runs from Everett, through Malden, Revere, and Saugus and ends on the Lynn line. Plans are being made to continue the trail through Lynn and end at Nahant Beach. A major focus of the group this past year has been to pave the one-mile Revere segment of trail, which is now covered in gravel. Once this is paved, riders from the North Shore will easily and safely pass under Route 1 on their way to Boston creating a truly regional bike trail on the scale of the popular Minuteman Bikeway that runs from Somerville to Bedford. For more information about this effort and to make a donation visit biketothesea.com. In Everett the group has been supporting the city’s effort to extend the trail from its current end in the “Village” neighborhood to the Mystic River, which will help the trail connect to Boston. This work is being considered as traffic mitigation for the Wynn Casino development. In Saugus, Bike to the Sea, Inc. has been awarded a grant from the DCR Recreational Trails Program to improve trail access points particularly at the Lynn town line. You will see these efforts take shape in the spring and summer of 2018. 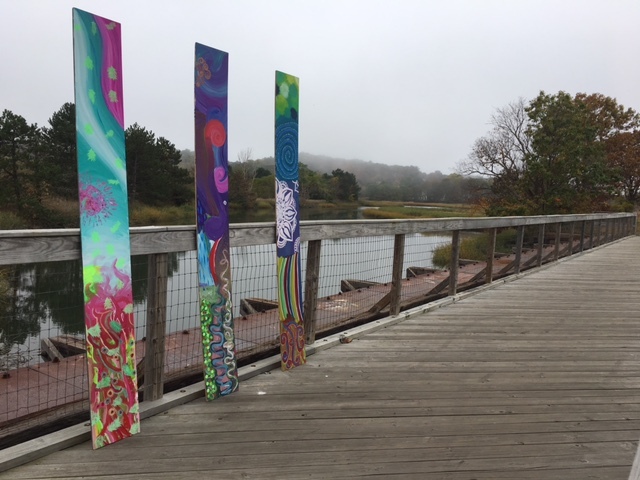 In Lynn and indeed along the entire length of the trail, Bike to the Sea has launched an exciting urban art project. The goal of this program is to link together the five communities through which the trail travels into a liner outdoor art gallery. The galleries culmination will be at Central Square in Lynn city where the “Beyond Walls” mural project is located. This 11-mile gallery could draw people from the larger region to explore the area by bike, helping to spur economic development and healthy active life styles from Lynn to Boston.